Listen to this track by Hamiltonian singer-songwriter and guitarist Terra Lightfoot. It’s “Never Will”, a storming track as taken from her second record Every Time My Mind Runs Wild. Nurtured by a pile of classic rock and pop records, and by roots heroes that may account for a distinct R&B meets folk- influenced swagger you can hear on this song, this tune is a concoction of indie rock approach meeting blues-stomp cajones. Terra Lightfoot, who is in fact not related to one of Canada’s most famous Gordons, has honed her craft while on stages shared with that particular Gordon, along with others like Ron Sexsmith, Sloan, Arkells, and Daniel Lanois among many others. Taking her craft very seriously, the songs on this new record were written and heavily re-written, partially with thanks to the lessons laid down by those others as represented by that aforementioned pile of classic rock records. The musical DNA of a those albums that served as examples to Lightfoot’s craft can’t be traced with any real precision here. But, the raw power that created them sure can be. 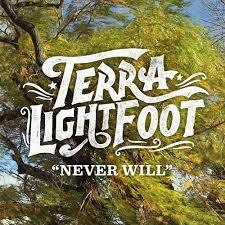 Terra Lightfoot wins on a few factors on this song, and on the rest of the record too. First, there’s her originality to consider. This is one of the indicators that sets the also rans from the up-and-comers; those who have a love of the music which inspires them, yet also have the drive and talent to create something original for others to love outside of those original sources. I’m no songwriter. But, I know when I can hear someone’s record collection instead of something I’ve never heard. On this tune, her alto voice that is full of R&B passion and classic seventies glam androgyny, but never devolves into self-indulgent theatrics is a unique instrument, offset by “ooh la-la-la” backing voices (who can resist that?). And I haven’t even mentioned that magnificently crunchy guitar sound she’s getting on this. Besides all that and second on the list, there is the chill factor, which is very present on this song. You know what the chill factor is, too. It’s that chill (or is it a thrill?) that makes your skin prickle in a good way. It’s a sheer physical response that takes you out of your thoughts when a song is playing, or is being performed. That’s here, too. Third on the list is the songwriting. Rock music in the end should be visceral. It should build itself up on a foundation of what came before. But, it should live and breathe on its own. And I think too that it should reflect human experience, pulling from what’s common to us, regardless of where we come from; attraction, insecurity, defiance, resignation. Who does she sound Terra Lightfoot, really? No one. And what about the type of music you’re hearing here? Is there something retro about it? Yes. But, is it thoroughly modern? Yes, that too. Can’t write a good song? Well, never say never. You can learn more about Terra Lightfoot, including her festival appearances this coming summer (with the Burnaby Blues & Roots Festival this year on the list, lucky for me!) at terralightfoot.com. At the time of this writing, her new website is about to be launched. But, in the meantime, you can preview the new album, and buy it. For a little dessert after the main course, here is a live and solo version of “Never Will” for those of you who want to get a sense of what to expect from Terra Lightfoot on stage. And for coffee after the dessert course (to stretch a metaphor), here’s a story from Terra herself about one of her favourite guitars – “Veronica“. I’ll be keeping an ear out for her in my parts. Reminding me some of Brandi Carlile and that’s a good thing.